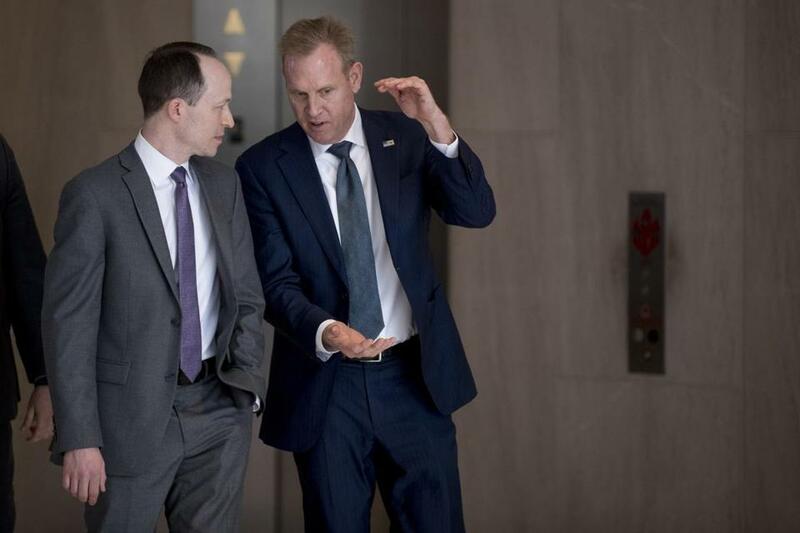 Acting Defense Secretary Patrick Shanahan (right) is also facing fallout from the crash of a Boeing jet in Ethiopia. WASHINGTON — The Defense Department’s inspector general said Wednesday that it was investigating complaints that the acting defense secretary, Patrick M. Shanahan, had been promoting his former employer, Boeing Co., and disparaging its military contractor competitors. The investigation will examine complaints filed last week by a watchdog group, Citizens for Responsibility and Ethics in Washington. Dwrena K. Allen, a spokeswoman for the inspector general’s office, said that investigators had informed Shanahan of the inquiry. Shanahan told lawmakers last week that he supported an investigation. The investigation complicates what is already an uphill battle for Shanahan’s effort to become the next permanent defense secretary. As recently as last week, Defense Department officials believed that President Trump was about to formally nominate Shanahan for the job left vacant by Jim Mattis, who resigned in December. But as Shanahan’s troubles mount, the White House does not appear to have a ready and able alternative to him. Jim Talent, the former Missouri senator, is one name which White House officials have discussed, according to former and current administration officials. Also under consideration is Robert L. Wilkie, the Veterans Affairs secretary. But Wilkie is viewed as doing a good job in a troubled department, and Trump is loath to remove him from his post, the officials said. The deadly crash of a Boeing 737 Max 8 jet in Ethiopia, along with mounting complaints that his cozy relationship with his former employers at the detriment of other military contractors, puts Shanahan’s fate in limbo. Shanahan served as the Pentagon’s deputy secretary under Mattis, a job that required Senate confirmation. Before that, he spent 30 years in commercial aviation and business at Boeing. He had hoped to bring his reputation as a corporate problem solver — including helping introduce the 787 Dreamliner — to the Defense Department. Several Defense Department officials predicted this week that it was unclear whether Shanahan could win Senate confirmation for the Pentagon’s top job, given his long-standing ties with Boeing and the fallout from the crash of the Ethiopian Airlines plane. Transportation Secretary Elaine L. Chao called Tuesday for her agency’s internal watchdog to investigate the process by which the Federal Aviation Administration in 2017 approved designs for the 737 Max. Lawmakers in Congress also are pushing for a review, while Canada is looking into its approval of the plane’s US certification. The specific allegations that the Defense Department’s inspector general is examining revolve around complaints that Shanahan disparaged competitors of Boeing during meetings at the Pentagon with senior national security officials and lawmakers, two US officials said. “The American people should be able to trust that government officials are working for them — not for big defense contractors,” Warren, who is running for president, said in a statement. While Mattis resigned in protest of Trump’s policies — including the surprise announcement that US troops would withdraw from Syria — Shanahan has held the line for the president. As the deputy defense secretary, Shanahan made clear that “we are not the Department of No,” as he told officials after the administration announced plans to create a new stand-alone Space Force at the Pentagon. It has since been moved to the oversight of the Air Force.